On this 40th anniversary year of the Apollo 14 space mission it is appropriate to consider Wheaton’s relationship to space. For nearly 70 years a domed observatory, resembling a derelict space capsule fallen to Earth, stood conspicuously on the front lawn of Blanchard Hall. With its telescopic eye poised to the stars, the “Lemon,” as it was nicknamed, informed generations of students about the graceful syncopations of celestial bodies. 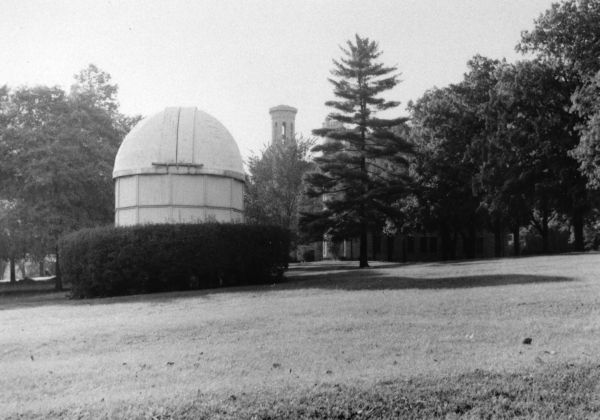 Since its 1972 relocation to Camp Honey Rock, the Lemon has been replaced by two successive observatories, both situated atop Wheaton’s science buildings. Since its inception Wheaton College has studied the metaphysical Heaven of the Bible, but the observatory symbolizes its engagement with the physical heavens – and those who’ve set their gaze on that boundless expanse. Harold Lee Alden, born in Chicago, graduated from Wheaton College in 1912. He acquired his master’s degree from the University of Chicago in 1913. After that he earned his doctorate in astronomy in 1917 from the University of Virginia, where he researched at the McCormick Observatory, using its 26-inch telescope, one of the largest in the world. In 1925 Yale developed a new telescope and shipped it to Johannesburg, South Africa, to observe the clear southern skies. Alden, sent to direct the program, lived there with his family for nearly 20 years, returning to the University of Virginia in 1945, where he served as professor of astronomy and director of the Observatory until retiring in 1960. He died at age 74. As one of 500 deceased men and women of science, including luminaries like Jules Verne and H.G. Wells, Alden was honored to have a crater on the dark side of the Moon named after him. Grote Reber did not attend Wheaton College, though many of his relatives did. In 1937 Reber, using parts from the University of Chicago and elsewhere, built in his parents’ back yard in downtown Wheaton a radar dish for cosmic radio reception. For ten years he was the only active radio astronomer in the world, listening to the weak but constant static of the solar system. In 1944 he published his discoveries on radio wave transmissions in the Astrophysical Journal. His research paved the way for satellite communications, AM and FM radio bands and cell phones. Reber’s radar dish is now displayed in Green Bank, West Virginia, on the grounds of the National Radio Astronomy Observatory. Reber’s mother, a school teacher, stimulated her son’s interest in science with articles written by her former pupil, Edwin Hubble, another explorer of interstellar mysteries. Born in Missouri, Hubble lived for several years in the city of Wheaton, though he did not attend Wheaton College. Graduating from Wheaton High School, he entered the University of Chicago; then, as a Rhodes Scholar, Oxford University. In 1923 he published his paper, “Island Universes,” revealing his discoveries regarding redshifts, the increased wavelengths of radiation emitted by a celestial object. The nebulae farther away, he observed, were receding at the fastest rate, indicating an expanding universe. His seminal work placed him on the cover of Time magazine in 1930. National Geographic cited him as possibly the most important astronomer since Galileo, and Stephen Hawking in A Brief History of Time stated that “Hubble’s discovery that the Universe is expanding was one of the great intellectual revolutions of the 20th Century.” Not only is a middle school in Wheaton named after Hubble, but so is an orbiting telescope, known for its occasional malfunctions as much as for its spectacularly successful functionality. Edwin Hubble died in 1953. Some information for this entry is derived from Mary Anne Phemister’s 32 Wheaton Notables, their stories and where they lived.